Sometime around the year 1375bc a startling event took place in Egypt. A form of monotheism was introduced by the Pharaoh Amemhotep IV also known to history as Ikhanaton. Where did Ikhanaton get his concept of monotheism? Well, let us recall the events of the Exodus, the plaques, the destruction of Pharaoh’s army; events that had touched the lives of every single Egyptian man, woman and child alive at the time. After which, three generations passed with Egypt suffering through decades of mediocrity. Then, Ikhanaton became Pharaoh… and Ikhanaton was a man with a plan. Did the pharaoh take his personal concept of a single all-powerful god from the Hebrews? Obviously, he did. the bush burned with fire, and the bush was not consumed. put off thy shoes from off thy feet, for the place whereon thou standest is holy ground. Ramses, The Great, is generally recognized as the Pharaoh of the Exodus, however, he was not. Ramses was a common name in Egypt; as a matter of fact, it was a Hykos name. The Hykos were a Semitic people who had invaded Egypt and ruled in the north for two hundred years. The name Raamses was common among the Hykos conquerors of Egypt. Obviously, the treasure city (Raamses) referred to in Exodus was named after a Hykos ruler of the time. 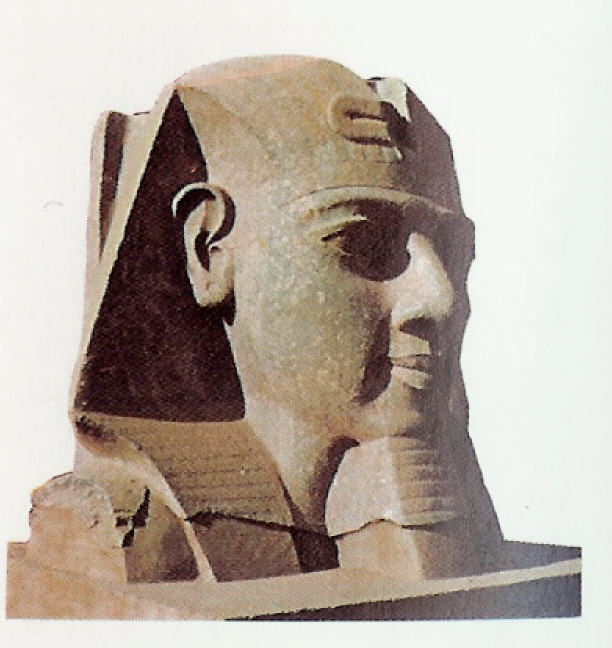 Ramses, The Great, was a later Pharaoh from around 1200bc, while the Exodus took place centuries earlier in 1447bc. 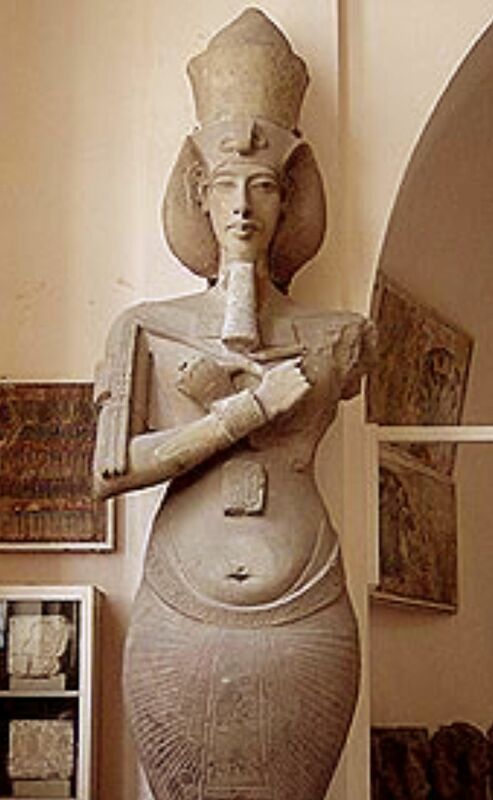 The photograph below is of a statue of Akhenaten, also known as Ikhenaten, that was taken at the Egyptian Museum (in the Armarna Room) where the statue is on exhibit. The reign of Pharoah Ikhenaten is fascinating for so many reasons one of them being not only did he change the theology of Egypt… he also seems to have changed the art. Egyptian art was very static throughout millenia, beautiful---but unchanging over centuries. Then, suddenly, during the reign of Ikhenaten everything changed. 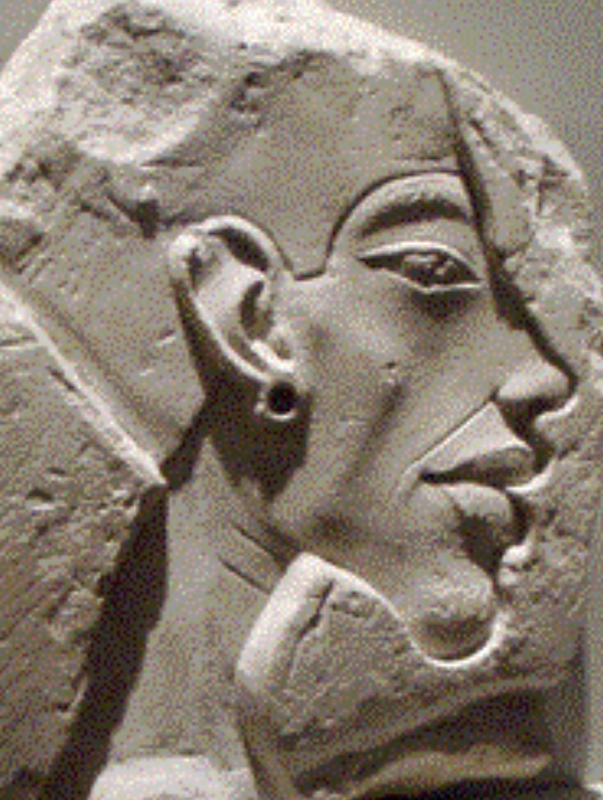 Look at the statue of Ikhenaten shown above, to us it almost appears to be a caricature. Look at the descended belly and the long exaggerated facial features. No one seems to have a credible explanation. Certainly these changes would not h taken place without Pharaoh’s accent. But Why??? Continued from Faith Archeology… The Sojourn: The Pharaoh Ahmose ruled a reunified Egypt for approximately twenty-five years, the beginning of a “Golden Age”. After which, his son, Amenhotep I, succeeded him, ruling for a decade or so, then dying without producing an heir. The throne thereafter fell to his sister the Princess Ahmose. However under Egyptian law a woman could not rule alone so her husband Thutmose was named King for as long as his wife lived---Pharaoh by marriage if you will. Was Thutmose insecure in his reign? Probably, remember this is only some thirty years after the era of turmoil and upheaval. In any case less than half a century after the demise of the “Shepherd Kings’ the Hebrews even in slavery became stronger and multiplied which precipitated a momentous event. That decree on the Hebrew children was, of course, carried out---only to lead to the rescue of the infant Moses from among the bulrushes by Thutmose’s own daughter. Before proceeding further however we need more background. The royal couple, Thutmose and Ahmose, unlike the Queen’s parents, Amenhotep I and his wife, had four offspring; two sons, Wadimose and Amenmose; and two daughters, Hapshepsut and Nefrubity. Additionally, it appears Thutmose had previously been married to another woman, possibly the Queen’s sister, and she had given him a son, Thutmose II. We know from archaeological records that neither Wadimose nor Amenmose, both of whom were in the direct line of succession, ever ascended the throne which leads to an inescapable conclusion, both must have died while their parents were still living. Evidently of the four children of the royal couple only Hapshepsut survived to advanced years. Now, armed with these facts let us proceed to the year 1527BC and the rescue of the future patriarch of Israel beside the bank of the Nile. What were the circumstances whereby the infant Moses avoided the Pharaoh’s death decree? The mother of the future patriarch set him adrift in a reed basket upon the Nile. 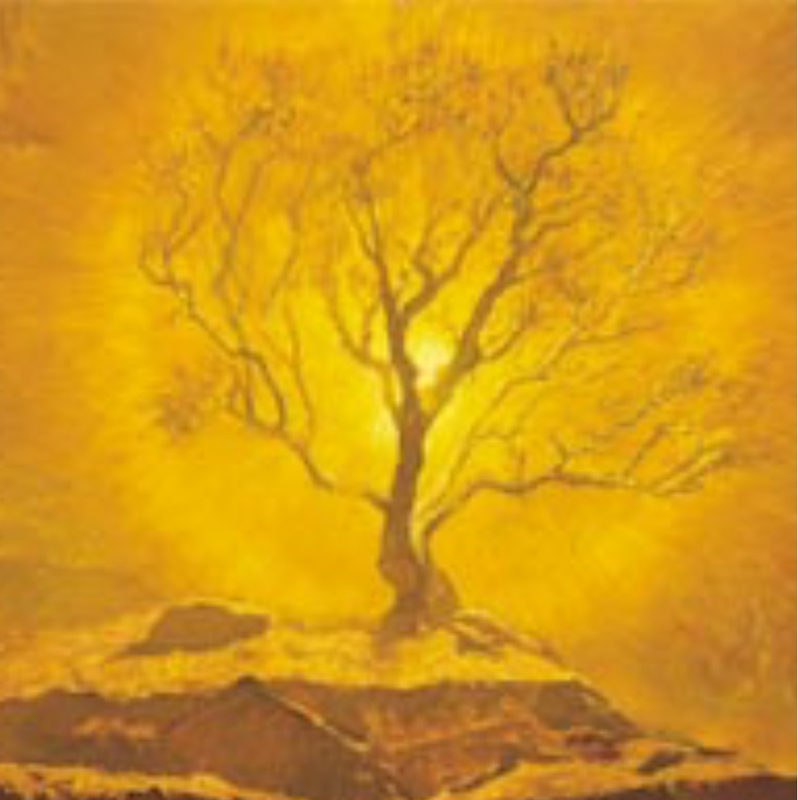 Was the mother of Moses exposing him to an uncertain fate or did she have something else in mind? Let us examine the facts. The future patriarch’s mother, Jochebed, was certainly familiar with pagan folklore of the day and may have been inspired by these ancient myths. For instance there is the Egyptian legend of Isis, according to which the goddess Isis upon the murder of her husband, the god Osirus, draws him from the river and brings him back to life. Another legend of the time was that of the great king Sargon conqueror of Mesopotamia who stated in his biography that he was brought into the world in secret, set adrift in a basket of reeds, and saved by a benevolent guardian. It is quite possible, knowledge of these pagan legends guided the trembling hands of Jochebed as she daubed the basket with pitch and placed it among the bulrushes. In any event, she was not simply abandoning the babe for we know that Miriam---the sister of the infant---stood by at a distance to watch over him. Assume for a moment, the Hebrew mother of the future patriarch was well aware of the young princess Hapshepsut and her daily routine at the river bank. Assume Jochebed placed the arc---perhaps with the Isis legend in mind---expecting the royal princess to discover the babe, be moved by compassion, and draw the infant from the river. Which of course, she did. Once again however, a question… Why would the young Princess ignore a royal decree of her own father in order to rescue a Hebrew infant? Let’s examine some interesting facts… The name Moses given to the infant by Pharaoh’s daughter could be translated as “son of the water” or “to beget a child”. This name appears as a common component in many royal names. For example, as in the names of the great Uncle of Hapshepsut, the great king Kamose who initiated the revolt against the Hykos and the Pharaoh Ahmose who overthrew them. Or, as in the names of Hapshepsut’s mother Ahmose and her father Thutmose as well as her brothers Wadimose and Amenmose. Each of these royal relatives of the Princess has a name containing the component Mose and if you drop reference to pagan deities from their names you get the same exact name she gave to the infant she rescued from the river, the name… Moses. Beyond which, we know that intense bonds existed between brother and sister in Egyptian society. Hence, given these facts let us entertain a hypothesis. Suppose Hapshepsut’s brothers, one of whom, destined to become pharaoh and very likely her husband to be, had died prior to the incident on the banks of the Nile. If so, the mother of Moses certainly would have been aware of the fact and perhaps counted upon the grieving Princess to be overcome with compassion and rescue the helpless infant thereby reenacting this Isis legend and breathing new life into the memory of her dead brother. Recall the Egyptian etymology of the name Moses ‘to beget a child’ and ‘son of the water’ and contrast this with Hapshepsut’s statement. Also, we know from Scripture that Miriam and her mother were able to approach the Princess quite casually. Does this indicate a degree of familiarity? Is it possible Jochebed and Miriam served the royal personage in some capacity? Scripture is silent. But, from the facts we know, we might even envision a bit of collusion in avoiding the royal decree. Speculation? Absolutely! Fascinating nonetheless. In any event there couldn’t have been a better protector for the future prophet of the Hebrew Nation. So what was life like for the young Moses? Again, Scripture offers little in the way of detail. We do know he became the son of Pharaoh’s daughter and of her life quite a lot is known. Hapshepsut, even though she was the sole surviving child of her parents and therefore their heir could not reign over Egypt alone. Thus she was married off to her half-brother Thutmose II who was thereby brought into the line of succession. The marriage produced only daughters however and once again questions arose regarding the king’s successor. And… just as his father had done before him, Thutmose II named his young son by a minor wife as his heir. Then, in order to give his choice greater legitimacy had the lad married off to the Princess Nefrure one of his daughters with Hapshepsut. Subsequently, upon the death of his father the ten year old Thutmose III was named king. Albeit, in name only. Because at this point in time, Hapshepsut, the “Great Royal Wife” of the dead king, began to take control of the government. For a time, it seems, she appears to have been content ruling from behind the scenes however before long Hapshepsut apparently decided to abandon all restraint. She pushed her stepson aside and named herself sovereign over the two lands. Using every device at her disposal to legitimize her usurpation until in due course she was, despite gender, Pharaoh in all respects. Thereafter, under her rule, the country entered a period of economic growth not known since before the Hykos. A state of affairs brought about in no small part by the able administration of her closest advisor, Senenmut. Of common origin, Senenmut was discovered by the queen early in her reign and was quickly elevated through a series of powerful positions until he eventually became her right hand. 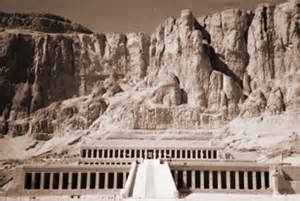 In the Queen’s service Senenmut began building on a scale not seen in Egypt for some time and for a number of years there was an unprecedented wave of prosperity throughout the land. Then suddenly, the wave crested when the fully-grown Thutmose III struck back. He began by toppling the uppity Senenmut and having him banished along with numerous other political supporters of his stepmother. Because he was the legitimate male Pharaoh, Thutmose III was able to enlist the aid of the priestly cults and thereafter continued to press his right to rule until finally---sometime around the year 1487bc---Hapshepsut died and he was king at last. He was thirty years of age. Immediately, Thutmose struck out and took his revenge on his stepmother’s supporters. Afterwhich, still not satisfied, he ordered Hapshepsut’s statues and monument dismantled and destroyed. Wherever The Great Queen’s name appeared, on monument or wall, Thutmose had the name chiseled away and covered over with the names of Thutmose I, II or III. So what is left to say about this remarkable woman? Was she typical of the pagan culture that spawned her---a culture known for producing arrogant, self-centered rulers? We think not. In her case the usual portrait of the heathen despot is softened by hints of a keen intellect and even a compassionate nature. We know for instance that Hapshepsut’s reign was a relatively peaceful era in Egyptian history. Wars of conquest so favored by the effete Pharaohs as a means of heaping glory upon themselves were practically nonexistent. Prosperity and relative peace seem to have been pillars of her rule. And we’re left with the image of a strong-willed woman, willing to brush aside the corrupt priests and defy the ruling elite---the extent of whose grip on the ten-year-old Thutmose III we can only speculate upon---and take the reins of power unto herself. In the woman we see the audacious spirit of the young princess who defied Pharaoh in order to save the life of a helpless Hebrew infant… thereby leaving a mark upon the history of mankind more permanent than all the pyramids constructed by all the pharaohs who ever ruled over the Nile valley. So what about Moses during all this time? Once more we are left with scant facts. But certainly, with a guardian like Hapshepsut, the youthful Moses had little to fear. We could even entertain the notion of a rather shallow youth enjoying the luxury that comes with being the royal ward. However, Moses was not polluted by the moral decay and heathen ritual around him and the day came when he was around forty years old, that he turned his back of the luxuries of Egypt. Called out by the suffering of his people the future patriarch had chosen to endure hardship among his own people when disaster struck, the death of Hapshepsut. Moses was forty-five years old when this event took place and with Thutmose III venting his wrath upon her memory it is quite likely that his safety depended on maintaining a low profile and not coming under the King’s scrutiny, but events conspired against him. His fortunes at low ebb, Moses sees an Egyptian smite a Hebrew and they sink even lower. Did the Egyptian recognize Moses? The Hebrew who had been a prince of Egypt. Did he smite the Hebrew slave in order to taunt the out of favor upstart? A not to subtle reminder, perhaps? Who can say? However, the following lines from the book of Exodus are revealing. To the Egyptians Moses was now merely a Hebrew and to the Hebrews he was merely a disgraced Egyptian. The Hebrew man asks Moses “Who made thee a prince and a judge over us?” Do we detect a note of sarcasm? Hapshepsut had, of course, but she was dead and her enemy Thutmose III was king. Even a slave had little to fear from Moses now. Perhaps, had Hapshepsut been alive and in power he might have been forgiven the deed but with Thutmose on the prowl, ferreting out supporters of his stepmother’s, Moses stood little chance and he took the only course open to him, he fled from Egypt. The best reference for the period of Moses’ stay at Median is as always the scriptures which cover events there in detail, so we pick up our inquiry around the year 1447BC. The king of Egypt referred to is Thutmose III and Moses, directed by God, returns to the land of Egypt… therefore we turn our attention to the Exodus and once again a question. Who was the Pharaoh of the Exodus? It was probably Amemhotep II although the archaeological record is practically non-existent. What we do know however is this, Thutmose died in 1447BC, Amemhotep II became Pharaoh in 1447BC, and the Exodus took place in 1447BC. Also, we know that it was not customary for the Egyptians to leave records of their defeats, witness the scant information available on the Hykos, and the events of the Exodus would have been a humiliation of monumental proportions. It is quite likely that Amemhotep II was the Pharaoh in question but we simply do not know for certain, and the record reveals little else about him as well. We do know that he reigned over Egypt from 1447BC to around 1420BC and the little that is known indicates his reign was relatively undistinguished. So there we have it, the Exodus takes place in the year 1447BC when an eighty year old Moses leads the mixed multitude out of Egypt. Should we wish to inquire farther however, what other facts are revealed that might lead us to definitely conclude that the Exodus took place 150 years prior to the reign of Ramses II? Let us return to out inquiry. Amemhotep II was succeeded by Thutmose IV who also appears to have ruled without distinction by Egyptian standards and about whose short reign little is known. After whom, Amemhotep III came to the throne, his reign notable mainly for its length, about 36 years. However, Ikhanaton preoccupied with his sun god Aton paid very little attention to the pleas of his vassals and throughout his reign offered no relief as city after city fell before the onslaught. And so… Scripture informs us, after crossing over into the land, Joshua, unhampered by Egyptian power, leads the Hebrew armies in a spectacularly successful campaign culminating in the conquest of many of the major Canaanite cities. After-which, we are told in the book of Judges, the total subjugation of the land became a long drawn out struggle, each tribe playing a prominent role in their own region until the whole became a single powerful political unit. The emergence of a brave new nation that throughout its early history does not escape for long the turmoil and upheaval from which it was forged. Thus for the first time in recorded history, other than scripture, Israel is mentioned as an independent nation and two and a half centuries later King Solomon begins to build the House of the Lord and we draw our 910 year journey to a close. Have we answered those questions we raised at the outset? Have we proven our case? Hopefully, but at the end each of us must, with the Lord’s help, decide that for ourselves. The tomb of Hapshepsut (she died around 1480BC) was discovered in the Valley of the Kings by Howard Carter, the English Archeologist, in 1916. The tomb was located in a remote area. Once inside, after the rubble had been cleared away, it became obvious to casual observers how much Hapshepsut was hated by her successor. After the death of Hapshepsut her successor, Thutmose II, had her monuments defaced and had the Great Queen all but erased from Egyptian history. Great Royal Wife, Lady of the Two Lands, Hatshepsut"
Most content on this website is provided by faithfortomorrow.net. If you wish to republish any of this material please contact the website administrator for information and permission. Wherever materials are used---not the property of faithfortomorrow.net---it is with permission of the owners and the original copyrighted source (if known) will always be given proper attribution. Yours in Christ, Faith for Tomorrow.